Fans of The Ethereal Gazette will undoubtedly recognize this modern classic by none other that Lovey Howard-Philips. We are of course referring to The Fanless Writer, a cherished piece of Art which will live on long after the mighty pyramids of Egypt have crumbled to dust. The punchline is, as always when it comes to Lovey Howard-Philips, flawless and brutal. She is very gothic that way. 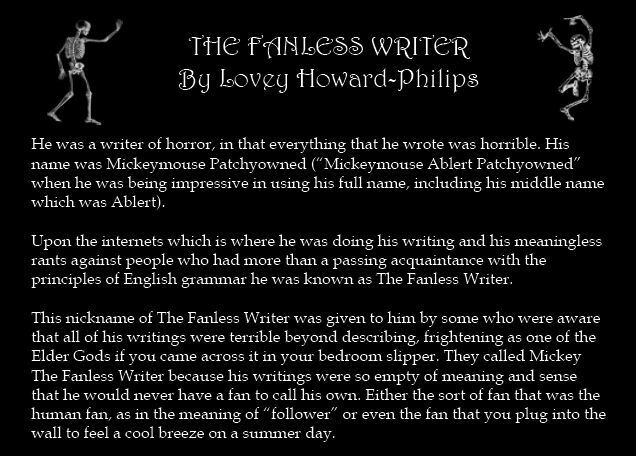 The Fanless Writer – When you pass beyond the veil, when you go to the other side… what untold horrors and mysteries will you encounter? The work is public domain, so share & enjoy. Click image to download your copy.